Thanks so much to OwlCrate for giving me a free box to review on the blog! I so appreciate being given the opportunity to receive one, as I cannot afford it on my own at this time. I've had my eye on OwlCrate's fun bookish subscription boxes for quite some time now, so I was really excited when I was offered the opportunity to receive one for review last month (Receiving a free box, however, did not sway my opinion in one direction or the other. My thoughts are my own!)! Who doesn't love bookish mail? 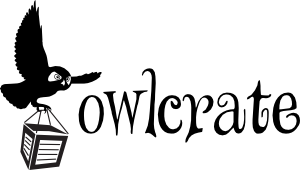 OwlCrate focuses on YA books (or sometimes an adult book that is appealing to YA readers), and each box is centered around a theme. Each month subscribers receive one newly released hardback YA book, along with some extra goodies that relate to the theme of the book. I love this use of themes, and think it's a really cool idea. These boxes run at $29.99 + $6.99 shipping per month (shipping to Canada is $10.59 and anywhere else is $19.99), but selecting 3 or 6-month subscriptions save you some money. 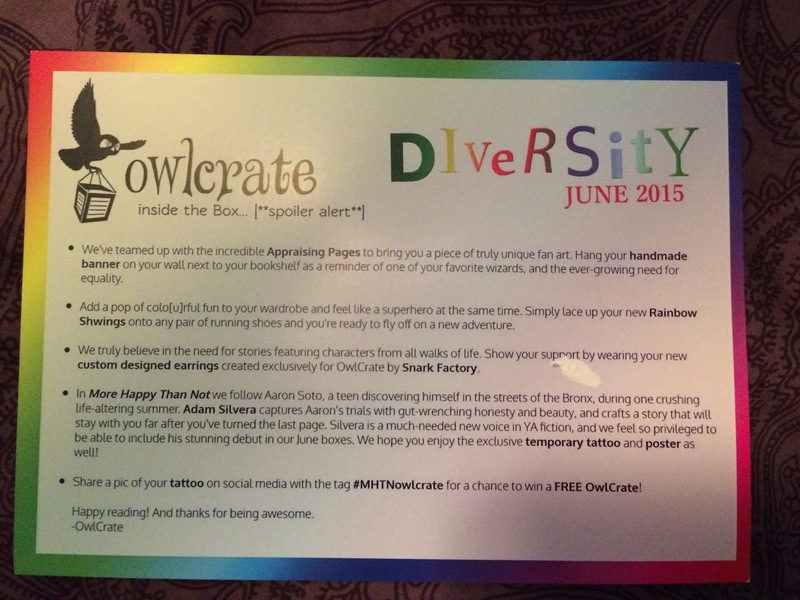 I really love the OwlCrate box! It was like a little treasure box sitting on my porch when I arrived home the other day. The logo is crisp and detailed, and I love the little owl footprints on the side of the box. I was immediately impressed before I even opened the box. I trust companies that care about making the little things, like packaging, professional and an extension of their service. This is what I saw upon opening the box. I like their sense of humor, and their owl puns. Puns just make me happy. I'll admit that I was slightly disappointed with the theme, just because I was hoping for cultural diversity. LGBTQ books are very popular and are generating a lot of buzz right now, so I was hoping to be introduced a to book with culturally diverse elements, which I have a harder time finding. This is just a personal preference, though, and since June is Gay Pride month the theme totally makes sense. I bypassed the postcard because I did not want my presents spoiled! I'll show it at the end, as it highlights each item in the box. Nice touch. Anyway, here's what I got! More Happy Than Not by Adam Silvera was packaged in a clear plastic bag with an exclusive poster and temporary tattoo. This book has gotten amazing reviews! As the host of the Debut Author Challenge on my personal blog, I was also happy to discover they were pushing one of this year's debut YA novelists! Adam is a really nice guy. 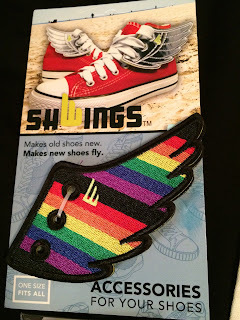 Shwings claim to "Make old shoes new. Make new shoes fly." I can't imagine myself wearing these as an adult, but perhaps kids or teens would like them! These cute "Read More Diverse Books" earrings were custom designed by Snark Factory exclusively for OwlCrate, which I thought was pretty cool! I'm a huge supporter of diversity in books, so I can totally see myself sporting these at the library or bookish events especially. OwlCrate a little pricey for me, so I won't be subscribing at this point. Also, if you're not into the theme of the month, you're kind of out of luck. It would be kind of cool if they had two monthly themes that you could choose from, but I bet that would up the price of the box. It's also a bit of a gamble, especially if you're a YA book reviewer who receives many of the new releases from publishers, because you never know if you're going to get a book you already own. In this case, I had already been offered a copy of More Happy Than Not from the publisher. I will most likely be giving my copy away either to the library or to a friend who might enjoy it. Concerns and personal preferences aside, I think OwlCrate is a great subscription service! I love the mystery and the anticipation of receiving a box and tearing into it to see what I got. Surprises make life so much fun. 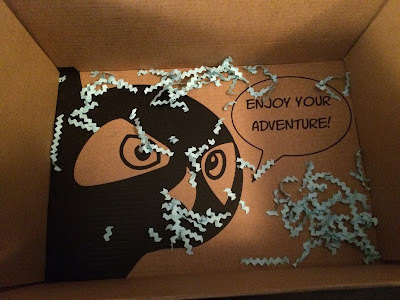 I love the details on the packaging, the themed box idea is so much fun, and I can tell that the creators of OwlCrate really care and have fun putting together boxes they think people will like. The entire service feels very personal, and I think it's so nice that this couple is so interested in spreading their love of books. I'd definitely recommend it to YA lovers and fans of bookish do-dads, especially if you're not as current on new releases or are looking to expand your reading comfort zone. I absolutely love getting unknown packages in the mail, so subscriptions boxes are like a dream come true for me. Unfortunately, most of these are indeed way too expensive for me, and there's quite a bit of stuff that doesn't particularly relate. Overall though, this box looks really fun and has some pretty unique contents! Oh my God, my birthday is in two weeks, and wouldn't this make an awesome gift for a YA fan who is trying to build up her classroom library?!? Thanks for the information! I'm so interested in all the different subscription boxes out there at the moment - they all look so exciting and this looks like a particularly good one. Like you say though, it isn't the cheapest desire to support, unless you've got lots of disposable income to throw around guilt free. Even if I did want to get one, international shipping is usually astronomical for these boxes unfortunately. Ah well, I suppose I can just post myself a book off my TBR shelf and some random junk I find lying around the house and imagine its a real owlcrate!